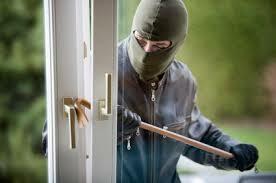 Burglars don’t always enter your home in a stealth like manner. Many times, they use a fast tactic and take as many valuables as possible in a short amount of time. 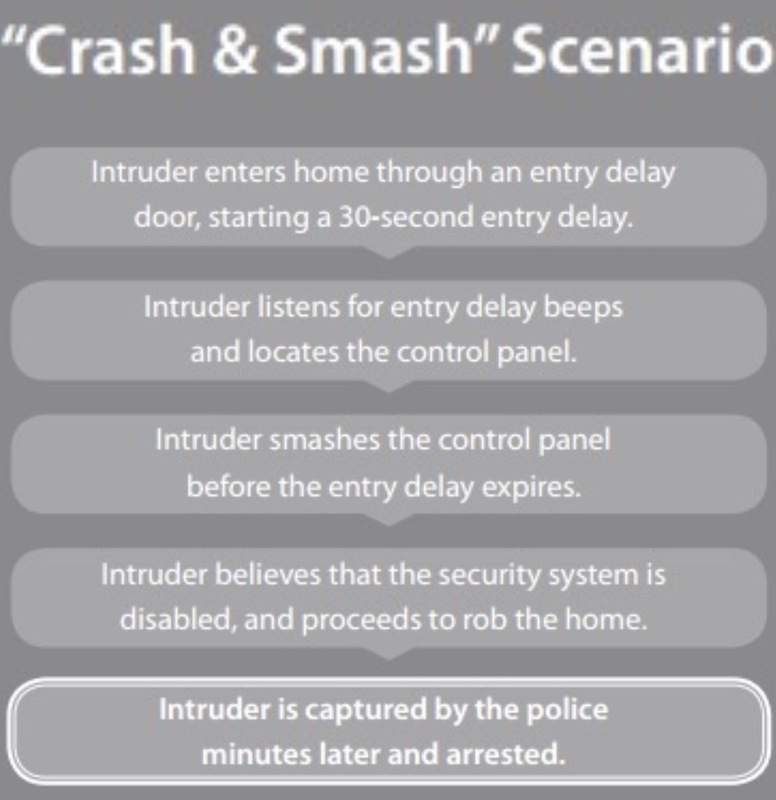 Crash and Smash Protection is a safeguard against a fast entry that can render other security systems useless. Many burglaries involve a crash and smash – when the intruder immediately damages a home’s security panel upon entry to stop any emergency signals/alarms from being sent. Simply put, an individual will crash through a home owner’s door and smash the alarm panel within seconds. Most security systems have a built-in delay to allow homeowners time to enter and disarm their panel. Many intruders take advantage of this by destroying the panel before the delay sends a signal. 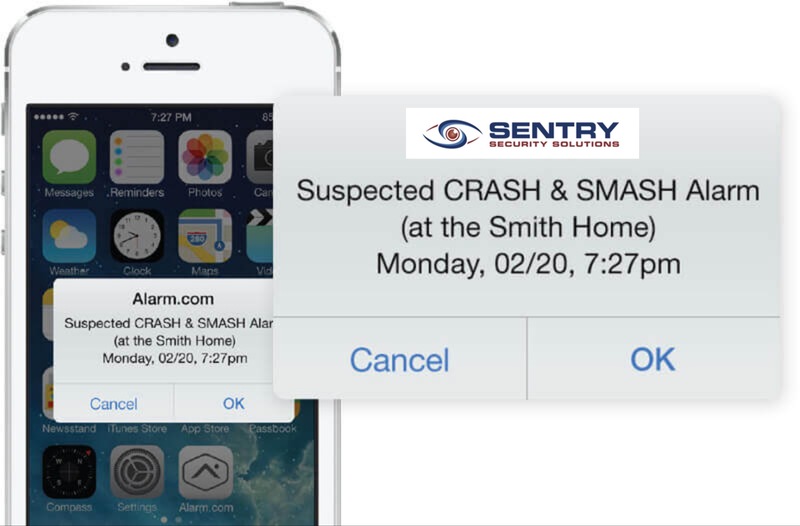 But with Sentry Security’s crash and smash technology, your alarm system will continue to work even after a panel is destroyed. Sentry Security proactively protects your home by using a smart home security system that monitors the happenings in/around your home 24/7. Your alarm panel is safe from a crash and smash burglary due to the fact we use a cloud platform. We are aware every time your alarm system is armed and disarmed. We also know every time a door is opened in your home. When your system is armed and a door or window is opened, our system closely monitors the following events. When you disable the alarm, all is well. When an alarm is set off, our monitoring station goes through the emergency process and treats it as a burglary. When a crash and smash takes place, the intruder may think he disabled the alarm because no siren is going off. What he does not know is it’s already too late because we know he is there and treat the situation as an intrusion. This is why our smart security systems with crash and smash technology are virtually impossible to defeat. Even if your alarm panel is targeted, Sentry Security has already proactive measures as soon as your door was opened, rather than wait for an emergency signal to be sent. Our free app will also send alerts to your smartphone so you will be aware of these events and ensure you never arrive to a dangerous situation. Crash and Smash technology is included for free with most of our systems. For more information, please CLICK HERE.